MAKE MORE PROFIT PER AGENT, PER DAY. BESPOKE INBOUND AND OUTBOUND CALL SOLUTIONS. Start saving time, become more profitable and grow your business with our bespoke inbound and outbound call solutions. INTEGRATE ALL OF YOUR COMMUNICATION CHANNELS. Bring together and intelligently route all of your communication channels, gaining a more streamlined approach for your clients and your team. Achieve maximum returns within weeks with our innovative contact centre call handling applications. Have everything on one screen with our KPI dashboards. Just think, if you have 10 employees with an average salary of £20,000, we could save you £348 per day. Based on these savings it would take just 27 days for this system to pay for itself. The benefit to YOU is that, each day after this, you will be making £348 per day clear profit AND own the software outright! Get in touch with us today to find out how we can help you to provide the best employee AND customer experience within your company, alongside fast ROI. This figure is an estimate using industry average metrics. To gain a more accurate figure, it is recommend that we have a discussion to really understand your business operations. 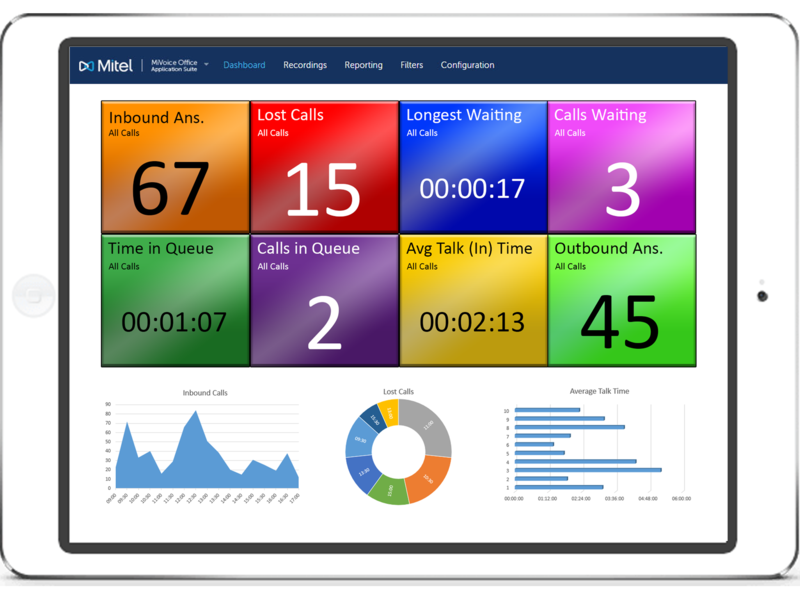 Installing Mitel Contact Centre call handling software in your business greatly benefits supervisors with real-time information dashboards. Employees will achieve fantastic results when using our automated dialing software to increase talk time and productivity on a daily basis. Our software is suitable for inbound and outbound contact centres and improves customer experience. These multiple channels include telephone, email, web chat, social media and SMS text messaging to name a few. Increased employee engagement, building a positive service climate. Let us show you how our call handling solutions can benefit your company today. Your staff will have access to all knowledge of previous client communication. Whether this includes previous account calls, inbound customer calls or emails, the initial contact that your customers make with your agents is critical for repeat business and client recommendations going forward. Choosing to host your telecoms server remotely means no maintenance costs and no in-house support staff needed. All software updates are done automatically and resilience is built in through backing up automatically to a secondary location, and no capital expenditure requirement. Enable supervisors to have a dashboard infront of them with all your key performance indicators lit in a simple colour coded alert system designed together. Key decisions can be made real-time by watching live information to ensure your customers receive the best possible engagement with your organisation. 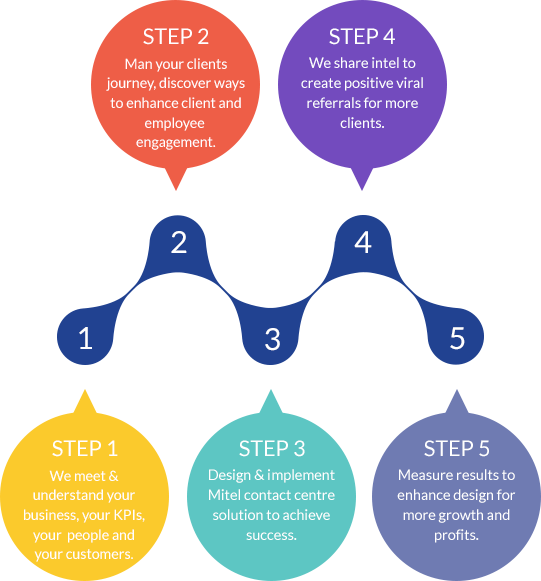 We can automatically measure the best success through Call Centre Dashboard KPIs, call recordings, successful employee activity, average call length and employee scoring. We then intelligently route inbound calls based on highest quality skills. Imagine if you could take your best employee and clone them! We can help you do this. Request a demo today, to see for yourself. We will visit your company in order to meet with key members of your team, helping us to gain a full understanding of your existing processes, how you analyse the current performance of your staff and to obtain knowledge on your customer base. A clear, current customer journey will then be mapped in order to provide you with solutions to help better this process to enhance customer engagement going forward. Once a solution has been agreed, we will develop and install your bespoke software. We share connections to provide a larger and more positive business network, resulting in potential clients for you. We measure results in order to continue improving your processes and customer experience, with the aim to achieve maximum success and fast return on investment for you. www.matrix247.com is a site operated by Matrix Platinum Limited (“We”); we are a company registered in England and Wales under registration number 3875632. Our registered office is Canal Mill, Matrix House, Kingsway, Haslingden, Rossendale, BB4 4QJ. Hospitality, Ticketing & Major Sporting Event Co.